OTC Oil show in Houston is one of the biggest oil show in the world. You can visit OTC website for more information of the show: http://2018.otcnet.org/ . Every year, over 2000 companies will come and attend the big events. 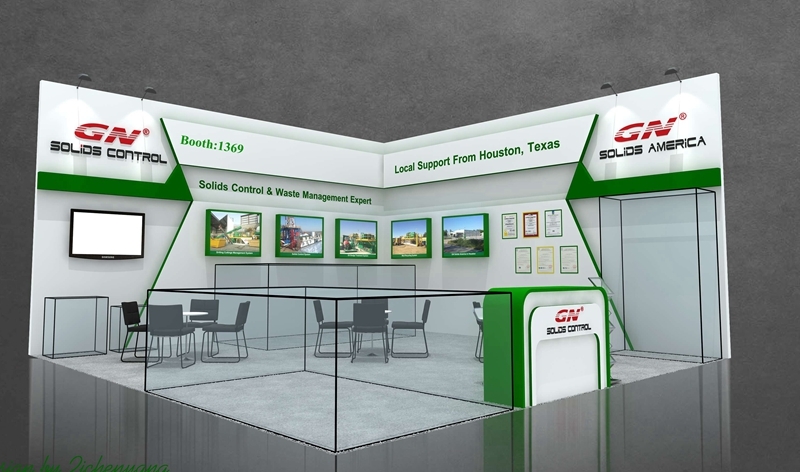 This year, GN Solids Control will come again for OTC oil show in Houston. 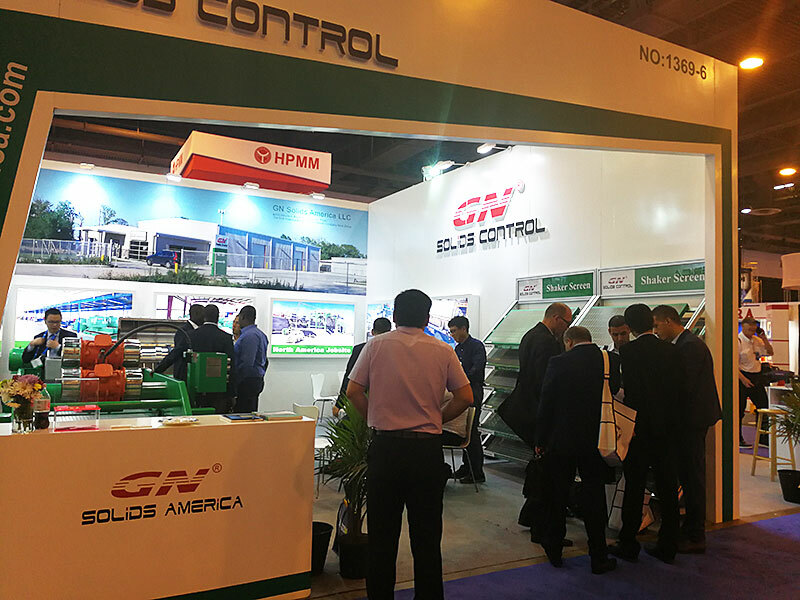 And the same with previous years, GN Solids Control, together with his branch company GN Solids America, will own 2 standards on OTC oil show, to help clients find GN easily. The location of the OTC oil show in Houston is not far from GN Solids America and his warehouse. Both GN Solids Control and GN Solids America Sales Team will come for the show. Customer can arrange for a visit to GN Solids America and the ware house after visiting the oil show. Clients can come and check GN Stock and products quality by himself in the wareshouse. 1) 14 inch decanter centrifuge GNLW363C for drilling mud purification and drilling waste management. It is the most popular side decanter centrifuge. 2) Linear motion 4-panel Shale shaker GNZS594F. It is a 4-panel shale shaker suits for oil and gas drilling rig mud system, as well as water well drilling and HDD drilling systems. 3) Sludge transfer vacuum pump GNSP-20A. It is a 100% air driving pumps suits for long distance and high solids content material transfer. 4）Mud Cleaner GNZS594E-2S12N with desander and destiler hydro cyclone cleaners. 6) High quality composite material shaker screens for different shaker models. Before Oil show, there will be a big oil show in Beijing in March 27~29. Welcome clients come and check. As all know, Australia market is with a very high standard. The standard is even higher than European market. GN Solids Control is the only one Chinese manufacturer who offered many mud recycling systems and drilling mud processing equipment to the market. Till now, there are over 30 sets GN made complete mud systems running in Australia. Nearly all of them are used for no dig activities: HDD drilling, CBM drilling or other underground constructions. As there are very few oil rigs in Australia. Recently, a full set of 400bbl mud recycling and mixing system was dispatch to Australia for oil rigs. We can say it is the first oil rig mud treatment system for Australia. As the customer said: Let me at the first to dry it. But as the truth, GN Solids Control sold some oil rig mud systems to Australia companies before, but none of t hem ship to Australia. They did their drilling job overseas. 2) 2 sets of mud tank complete with mud agitators, electrical control system, lighting system, pipelines, guidrails, walkways, ladder, and other accessories for full function. 3) 2 separate jet mud mixing system is connected to the 2-tank mud system to prepare qualified drilling mud. The mixing system is composed of a mixing hopper, a centrifugal mixing pump, the pump and hopper are connected by pipelines and controlled by a separated Explosion proof control panel, all above mentioned items are mounted on an oil field skid for easy layout and movement. GN Solids Control does design and make different capacity Liquid Mud Plant to suit for oil base mud mixing, water base mud mixing and SOBM mud mixing. 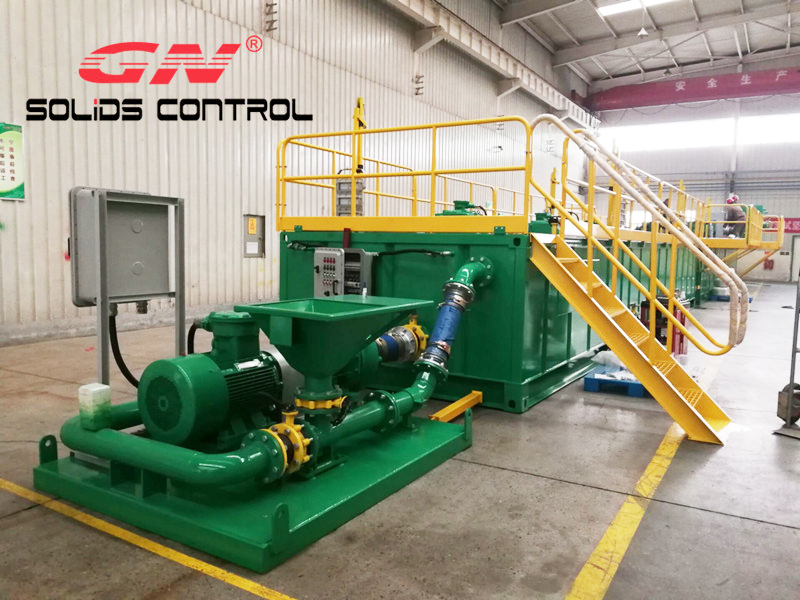 GN Solids Control offers 2 types design of the liquid mud plant: the vertical type liquid mud plant and the Rapid Deployment Liquid Mud Plant (RDLMP). 7) Mud Mixing Tank equipped with mixing hopper, mixing pump and mud agitators. All GN brand mud tanks are designed and makes to suits for oil field outdoors application. Painting and coating is an important effect of the mud tank lifetime. 1) GN Solids Control only choose and use international famous brand for coating and Painting, like PPG, or Japan Kansai Heavy Duty Marine Painting. 2) All GN made mud tank will be treated with Ball or Sand blasting per SA 2.5 Standard. If you have any questions about liquid mud plant, welcome you contact GN engineers. 1) GNMS-500B is an economic standard mud treatment and recycling system for HDD rigs, CBM drilling and water well drilling rigs. The main processing equipment is a double deck mud cleaner. The double deck mud cleaner is a combination of a double deck shale shaker and desilter cone assembly. It can save footprint and save cost. The usable tank capacity is 10m3 of the total tank system. Total power of GNMS-500G mud recycling system is 84kw. It suits for customer with limited space at jobsite, or for clients want to save cost. 2) GNMS-500G is a general standard and most popular model of mud treatment and recycling system for HDD rigs, CBM drilling and water well drilling rigs. The system includes a single deck shale shaker. A separate mud cleaner is combined with shale shaker, desander and desilter cone. Tank useful capacity of GNMS-500G mud recycling system is 16m3. It is bigger than option 1 GNMS-500B mud recycling system. Total power of GNMS-500G mud recycling system is 126kw. 3) All processing equipment of GNMS-500GL is the same with GNMS-500G. Total power of GNMS-500GL mud recycling system is 126kw. But it is with a bigger size tank and a tank usable capacity. It is with 25m3. 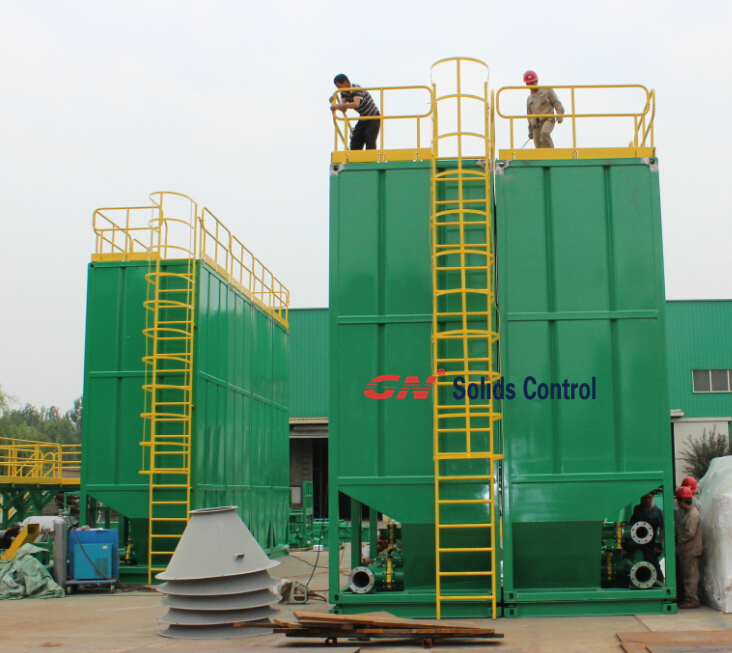 All shale shaker and mud cleaner are complete with a full set of high quality composite material shaker screen while dispatch from GN Solids Control factory. All GN made mud tank will be treated with Ball Blast before painting. All tank are with External paint and internal coating for better anti-corrosive. 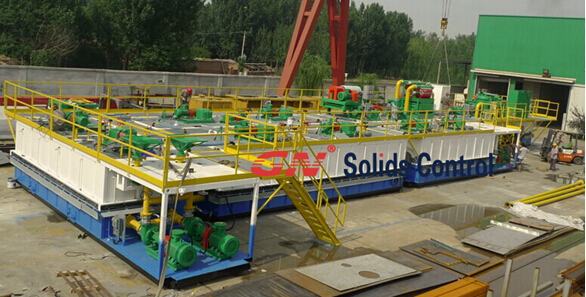 Recently, GN Solids Control finished the fabrication of a set of automatic Drilling Cuttings Solidification Unit. The Drilling Cuttings Solidification Unit is a customized design for CNPC Project. Based on GN standard design, clients ask for more smart control to realize the automatic running of the unit. The automatic Drilling Cuttings Solidification Unit can minimize the manpower for operating the solidification unit, and furthermore to reduce operation cost of the project. The Drilling Cuttings Solidification Unit is equipped with automatic control system. PLC control system control the 3 sets feeding screw conveyor: 1 conveyer for lime feeding, 1 conveyor for absorber feeding, and a main screw conveyor for the drill cuttings transfer and feeding. The mixing tank is equipped with an automatic control valve, and connected to the PLC control system. The automatic control valve can open for discharge and close for mixing automatically by the PLC direct control system. The Drilling Cuttings Solidification Unit can be used for continuous solidification and fixed agitation. The 3 feeding screw conveyors ( 1 for lime feeding, 1 for absorber feeding, and 1 for the drill cuttings feeding) can be setup the feeding rate and transfer rate, then the 3 conveyers can be operated with setup rate and time to realize timing agitation and timing discharge. With the automatic PLC control system, the drill cuttings solidification unit can also realize continuous mixing and discharge. Drilling Cuttings Solidification Unit is mainly used to treat water based mud cuttings. Besides Drilling Cuttings Solidification Unit, GN Solids Control can also offer high G shale shaker, dewatering unit, high speed decanter centrifuge, etc…Furthermore, GN Solids Control offers Vertical cuttings dryer and centrifuge for oil base mud and cuttings. GN Solids Control offers turnkey solution for all kinds of drilling mud and drill cuttings: oil base mud, water based mud and WOBM mud. • Helical Bevel Gear Box for high efficiency and high performance. • 3-5/8″ Agitator Shaft Dia. for heavy mud operation. • 44″ Canted Mud Agitator Impeller for standard oilfield mud tank. • Necessary Couplings & Bushings for connection of the gearbox and motors. • Bottom Stabilizer for stable operation for deep mud tanks. If you have your own tank, please just send us your mud tank drawing with dimensions, we can use our software to calculate and select the suitable mud agitator for you. Besides the horizontal mud agitator, GN Solids Control also design and manufacture vertical mud agitator for less foot print installation. 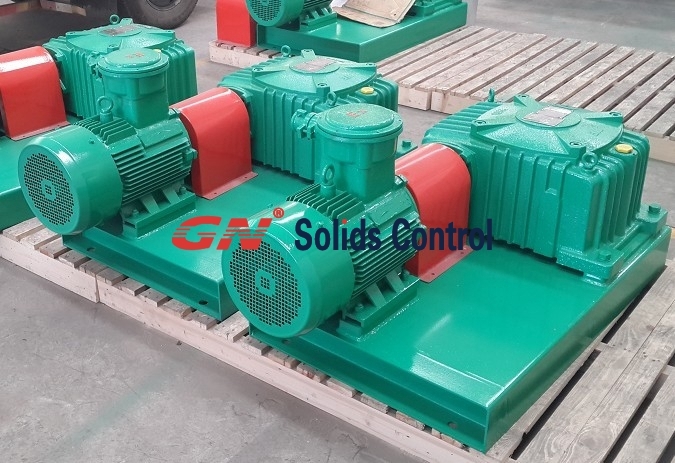 GN Solids Control is the first API certified mud agitator manufacturer in China, and we have our branch in Russia and USA to service the local clients with fast speed. For last 10 years, GN Solids Control has grown up from 10 employee company to a 200 employee company with our business coverage over 70 countries and regions. Our mud agitator is polular used for drilling mud mixing tank, storage tank, and recycling tank to avoid the settlement of the solids in the mud tank. And our mud agitator is popular for oil industry, HDD, and CMB drilling as well as mining industry. The drill cuttings skip is also called solids skips, waste collection containers, or skips. GN Solids Control can design and make drill cutting skips for the solids control system and drilling waste management systems. 1) The drill cuttings skips are designed and fabracated accordance with DNV 2.7-1 standard. 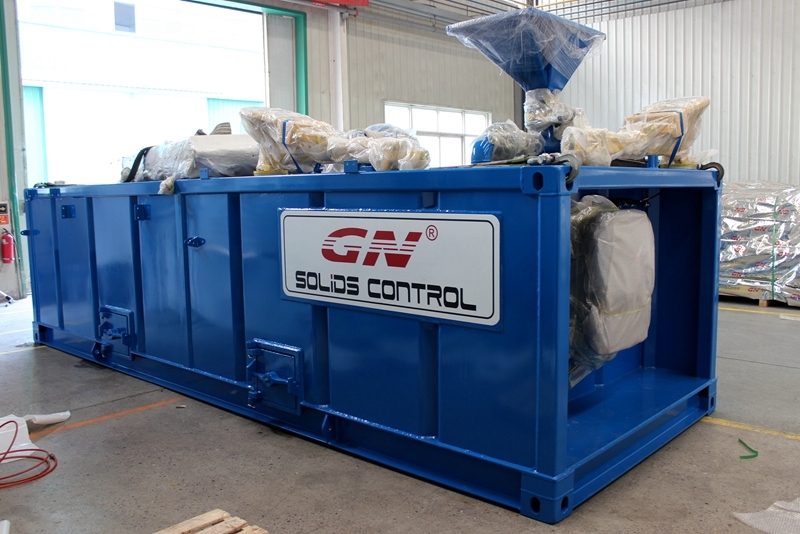 GN Solids Control can offer DNV 2.7-1 lifting certificate for the cuttings skips. The drill cuttings skips are capable for onshore and offshore applications. 2) The cuttings box is suitable for hazardous material transportation. The waste collection containers are completed sealed to avoid spill during transportation. And the cover is designed with an easy lock and unlock system for fast opening and closing. It is the ideal container to meet the HSE regulations for hazardous waste movement. 3) As manufacturers with his own research and development department, GN Solids Control can offer customized design drill cuttings skips to collect the drilling waste. The skips can be equipped with forklift access from all four sides, or only from 2 sides. 4) GN Solids Control designed and made drill cuttings skips (waste collection containers) suitable for container shipment. The waste collection containers can be put into container and loader with 2 layers. A full 40ft sea freight high container can load 14 ea waste material collection containers. The design can min. the sea freight cost, and also save clients inland shipping cost to move the waste collection containers. 1) The drill cuttings skips can be used to collect and move the drill cuttings discharged from the drilling rig solids control system, like shale shaker, mud cleaner, desander, desilter and barite recovery decanter centrifuges. 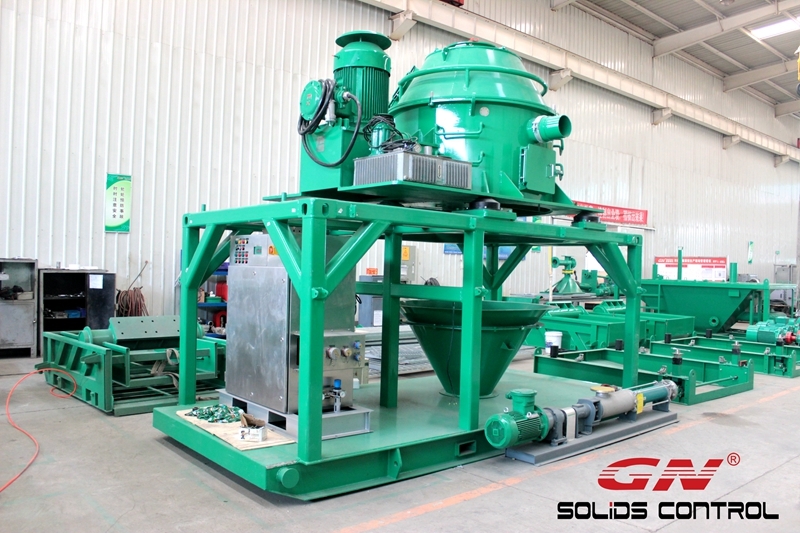 GN Solids Control just complete a batch of drilling fluids shale shaker for Russia client. The shale shakers are going to install for 3 big oil drilling rigs. The model of the shale shaker is GNZS594E-HB shale shaker with 4 panel of pretension composite frame shaker screen. Russia is one of the big oil production countries. China and Russia economy relationship is very close. The Belt and Road policy also drives the economy between China and Russia. GN Solids Control business has been growing fast in last 2 years. GN Solids Control has set up offices in Russia and been working together with local partners to offer fast support to Russia client. to 7.5 G. High G force for better separation and efficiency. 2) The shaker bed below the screen is made from stainless steel to have anti-corrosion features for longer life. 3) Patent shaker screen seal technology for avoiding fine solids bypass and to have easy maintenance. 4) Italy OLI or US Martin Brand Vibration Motors, GN Ex Control panel with SIEMENS or Schneider Component. Reliable performance and make it easier for spare parts replacement. 6) User friendly shaker locking system made from stainless steel. 7) The vibration spring is covered with rubber for safety and less noise. GN Solids Control shale shaker include different models from 2 panel mini shale shaker GNZS752, ,3 panel shale shaker GNZS703, 4 panel shale shaker GNZS594 and 6 panel double deck shale shaker GNZS706. Depends on different jobsite conditions, we can select the best suitable shale shaker for the operation. Normally, we keep a minimum of stock of 20 shale shakers in stock for fast delivery. 1) The first deck on the top we call it as scalping shaker deck. The screen in this deck is called as VSM300 Scalping shale shaker screen. It is made from composite material. There are totally 3 ea scalping shale shaker screen for the first shaker deck. The scalping shaker deck will use coarse scalping shaker screen to remove the big sides sands and particles. 2) The second deck in the middle of VSM300 shale shaker is primary deck. The shale screens are used in primary deck is called as VSM300 primary screen. The primary deck is the major separation deck of VSM300 shaker. There are 4 pcs primary shaker screen for this shaker deck. The original VSM300 primary shaker screen is made from composite material for longer life time and longer storage time. 3) The bottom deck of VSM300 shale shaker is drying deck. There are 2 pcs drying deck shaker screen in this deck. The drying deck screen is very small size, with dimension only 685x203mm. The VSM300 shale shaker is with totally 9 ea shaker screens : 3 ea scalping screen for the first deck, 4 ea primary screen for the second deck, and 2 ea drying screen for the bottom deck. As it is in the bottom and is with very small area, many shaker operators do not use the drying deck shale shaker screen, in order to simplify operation and reduce the screen cost. Replacement screen is a big and general cost for the VSM300 sakers. 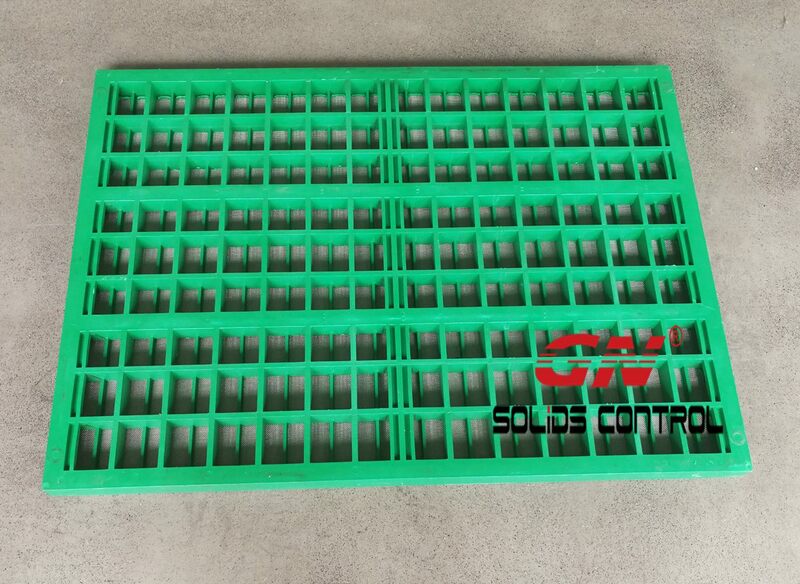 Where you can source the high quality replacement screen for VSM300 shaker? 1) Firstly, you can contact NOV Brandt, the shaker supplier to get the replacement screens. 2) Secondly, besides Mongoose shaker screen, Mi-Swaco also make screens for other brand shakers, including screens for Brandt VSM300 shakers. 3) Above 2 companies are both from U.S. If you want to get high quality interchangeable screen with competitive price, GN Solids Control is your ideal choice. 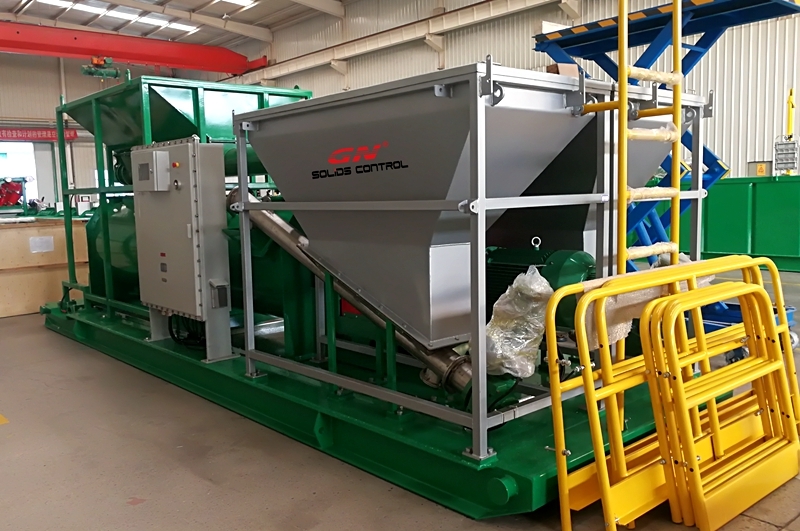 As an international reputable brand solids control manufacturer, GN Solids Control owns the complete production line for composite material shaker screen. GN brand replacement screen, the quality is equal to OEM, for some models, it is even better to the OEM, but price is much more lower.